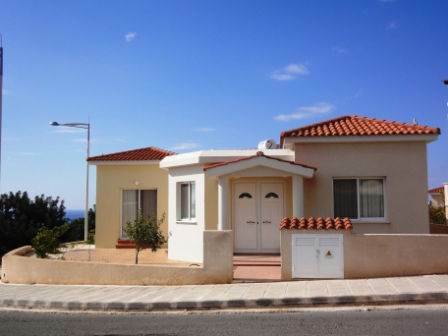 Cyprus Property Blog by Cleo : New on the Market - Bungalow in Tala with Sea Views - NOW SOLD! • 115 sq. m., 1 bath, 3 bdrm bungalow	-	€239,000 EUR	- Sea Views - NOW SOLD! Tala, Paphos	- This 3 bedroom bungalow with lovely sea and countryside views is situated on a corner plot in the popular village of Tala. The accommodation features a spacious lounge with patio doors opening onto a paved terrace. An archway leads to a large kitchen/dining room which is well equipped with built-in oven and hob, American style fridge/freezer, washing machine, and dishwasher. There is plenty of worktop and cupboard space, and there are fitted shelves on the one side of the dining area. A second archway from the lounge leads to a hallway, off which are 3 double size bedrooms (all with fitted wardrobes), and a good size family bathroom. The master bedroom also has patio doors opening onto the outside terrace. The property is very low maintenance as all the areas around the bungalow are graveled, and there is a communal pool a short walk away. The driveway is on the one side with steps leading up to the bungalow. This property is ideal if you prefer to be part of a communal project, and yet want to have a villa style property, rather than an apartment or townhouse. It is suitable for residential or holiday use.